Below are listed common issues that people tend to run into and their resolution. These are in no particular order. 2. Corruption of drive, either due to age (average life span of a HDD is between 3 and 5 years) or, in the case of USB Flash Drive's, read/writes. 3. Improper shutdown, such as a power loss (or surge). 4. Malware infection that has deleted your data. 1. Immediately run a backup of the drive with Parted Magic using CloneZilla, and image the whole drive as a precaution. Then, if using Windows, run a 'chkdsk /R' from command prompt from within the OS. Either by pressing F8 when before Windows Logo is shown and selecting 'Safe Boot' with command prompt (recommended) or once logged into windows(not recommended). The computer typically will asked to restart to complete the action and may take several hours to complete depending on the size of the drive. If it cannot repair issues or after repair, corruption (data loss) continues, then you need to replace your HDD immediately as it's failing; boot into Parted Magic and search the drive for your documents and remove anything you need. 2. If you were infected with malware, such as a virus, then running a chkdsk will not help until you run an antivirus/malware remove program on the drive. There are several anti-malware programs included on UBCD, (eg. AVIRA AntiVir Rescue System). Please run a scan with one of these Tools first, or if you have your own malware scanning application, then use them first and then after removing the infection, run a complete 'chkdsk /r' from command prompt. 1. Check all fans are running and if need be, with system plugged IN but power switch OFF, clean out the dust, hair, and balls of lint from the fan grills and Heat Sinks. 2. Compressed air (or cans) is not suggested, as it contains a conductive liquid before it evaporates and can cause a short on the motherboard; it but better to use a vacuum with a plastic bristles attachment to clean out stuck on dust. This is the proper way to make sure your computer is OFF but grounded before you do any work on it. Run a full system anti-virus AND anti-spyware scan. Preferable one at a time. An anti-virus doesn't typically detect malware outside virus, trojans, worms and the really nasty spyware, this is why you typically need both antivirus AND anti-malware (aka spyware) scanners both installed on your computer. Common used ones that are FREE are: Spybot - Search & Destroy, Malwarebytes Anti-Malware Free, Lavasoft: Ad-Aware Free, SuperAntiSpyware: Free Edition, and Microsoft Security Essentials. Remove all traces of anything found after making a system backup. Remove any applications you haven't used that you have installed or came packaged with other software, such as toolbars. One of the worst things that gets installed extra when installing an application, is a toolbar, remove them to speed up your browsing and overall system. Goto-> Control Panel and then Add/Remove Applications (or Uninstall a Program on Vista,7,8). Any toolbar you don't actively use, remove. Click on the toolbar, and select uninstall at the top, or right click on the application and select uninstall. While you are in there, remove any applications YOU installed then you no longer run or need, but not applications you didn't install, as you don't want your sound or video card drivers being uninstall by accident. NOTE: If you have questions, or need assistance, first try searching Google for the name of the application you are interesting in removing, then if you absolutely want to remove the application and are still unsure, try posting on the forums with an image of your list of installed applications, we could suggest which ones to safely uninstall. It's better to be SAFE than SORRY when it comes to removing applications. Cleaning out Junk files. Typically Windows computers store temp files for applications and cache that are placed on the drive for when things are being updated and installed and run for the first time and most often than not, they just sit there, piling up. 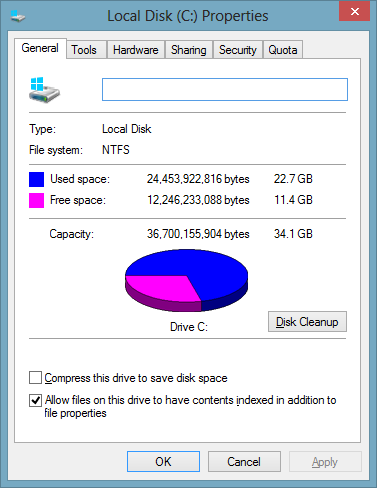 Easiest way to go about cleaning them is to goto My Computer (Computer on Vista,7,8) and right clicking on your Primary Drive (Typically 'C:') then selecting 'Properties', from there you should see a 'Disk Cleanup' option. This will open up a new windows and scan your drive you selected for temp/junk files. Once complete, select "Cleanup System Files" box in the window that opens, let it scan again, then select all the check boxes, then select cleanup. This process could take a few minutes. Note: You may want to leave Windows Upgrade files alone, unless you have the system disc your computer came with, as it prevents you from upgrading or downgrading your system in the event you need to. If this doesn't matter or apply to you, you may safely remove the files without any issues. 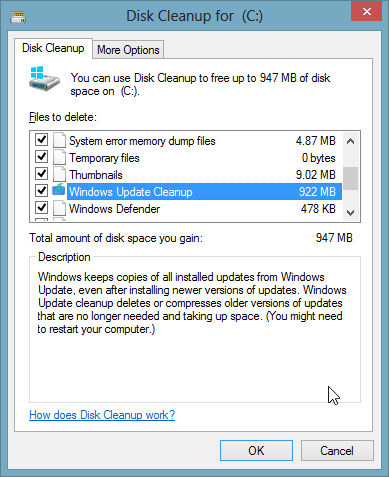 Optional: Once you have cleaned up the system junk files, we can to clean up application junk files. The best way to do this is installing a free application CCleaner. After installing, open it up and select the apps you want to clean up, or leave it as default and Run it. After finishing, should be cleaned of Junk files and will show you how much CCleaner cleaned up. Defrag your computer. After cleaning up Junk files from your systeam, removing applications you no longer need, and removing spyware/malware from your system, your computer files tends to be fragmented. Basically, files are not organized and lined up to be easily read (imagine a book with pages numbered, but out of order, makes it harder to read the book because it takes more time to do so, but still readable); This is called File Fragmentation. On Windows OS's, behind spyware, this is the most common cause of computer's slowing down and starting up slowly. While there are many alternative applications to get this job done, using the Windows defrag utility will be the easiest way to solve this issue and get your system back up to speed. Note 1: DO NOT Defrag SSD's! Note 2: It's also highly recommended to defrag after cleaning up your junk files, removing applications, and atleast once every 30 days to keep the system in peak condition. If the computer is used more often, than once every other week or if used daily weekly could be used. Note 3: It's NOT recommended to run a scan more than once every 30 days on Laptop's because the drivers are smaller and in a tighter, confined space, thus preventing heat caused by heavy HDD activity (or Defragmenting) from being removed from the HDD, reducing the HDD lifespan. This page was last edited on 17 May 2013, at 02:02.